There are few places as romantic as Italy's Amalfi Coast! Our first trip there felt like a dream as we drove a convertible down the winding cliffside roads to the pretty oceanside town of Positano. With the wind in our hair, smell of lemon groves, and peekaboo views of the ocean, we were so distracted by all the beauty, we almost crashed! The area is one of the most popular for Italy destination weddings due to its incredible scenery. How can you not fall in love with the famous views of the sheer cliffs, dramatic shoreline, pastel-colored buildings, and deep blue of the Tyrrhenian Sea? For couples planning a destination wedding in Italy, the Amalfi Coast offers many beautiful venue options. Our three favorite wedding locations there are Villa Caruso, Villa Cimbrone, and Villa Rufolo, all of which are located in the clifftop town of Ravello. At Villa Caruso, a restored 11th century palace, we love shooting at the incredible infinity pool and the Piano bar with its frescoed ceilings. Villa Cimbrone, an exclusive aristocratic residence with a storied 900-year past, has the most beautiful classical gardens adorned with statues, columns, pavilions, and geometric flowerbeds. Its spectacular Infinity Terrace adorned with 18th century marble statues must surely be the most luxurious place in Italy for wedding guests to enjoy cocktail hour! At the historic Villa Rufolo, just a few minutes walk from the main square of Ravello, we love framing couples within the stone arches and exploring the gardens of lime and cypress trees. The balcony with the distinctive stone pine trees (also known as umbrella or parasol pines) overlooking the sea is a favorite place for an classic bride and groom portrait. This Italy destination wedding portrait was photographed in one of the winding alleyways of the little town of Positano. After the couple's exchanged their vows on a classic Italian terrace overlooking the ocean,the entire wedding party explored the city together before the reception. This image was captured when the bride and groom took a little rest after climbing up and down many stairs to reach their reception venue. 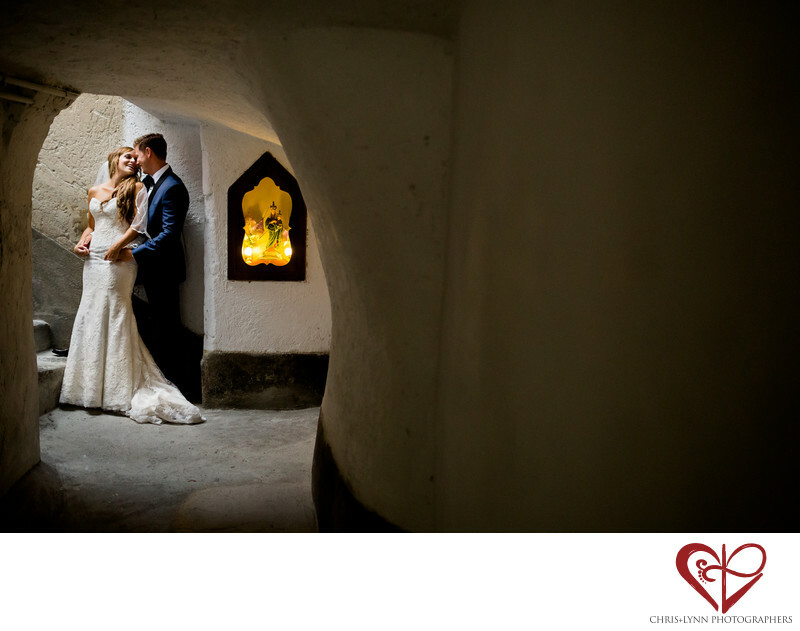 We loved the intimate moment and the combination of the natural light and warm candlelight in the wall's portico. 1/1000; f/1.8; ISO 1600; 35.0 mm.